Chris Baily champion at the first International Blind Tennis Championship held in Spain. Updated: Friday, May 12. More pictures added Tueday, May 16. 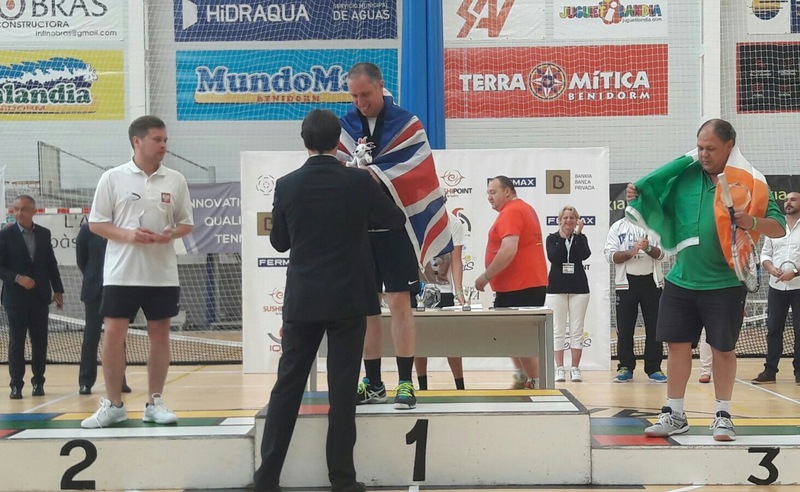 Uckfield tennis player Chris Baily stood on top of the podium at the first International Blind Tennis Tournament in Spain last week. Draped in the Union Flag, he received the laurels for winning the part of the competition within which he was competing. The Tennis Foundation reports that Chris defeated Poland’s Grzegorz Korpinski 2-4, 4-2, (10-5) after a deciding match tie-break in the men’s B3 singles final. After a nervous first set the Uckfield player settled in the second set, moving his opponent from side to side to win some long rallies. Chris was always ahead in the match tie-break and completed his historic win on his own serve. 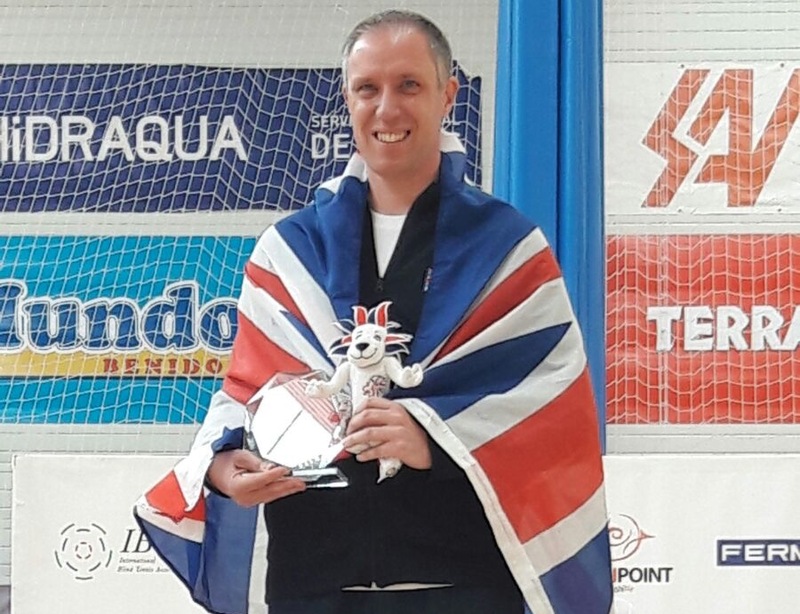 Uckfield’s Chris Baily on top of the world after his win at the first International Blind Tennis Tournament held in Spain. 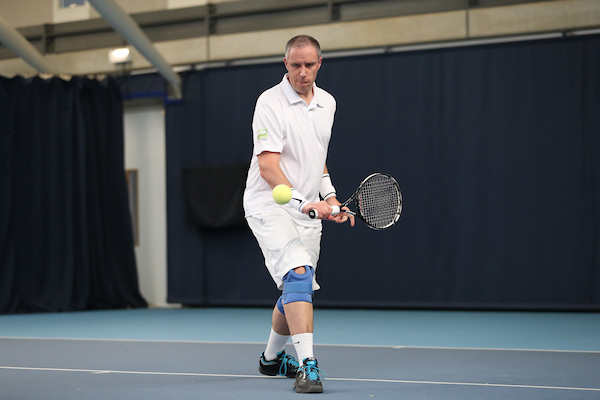 Uckfield’s Chris Baily has been selected to join the Great Britain team to contest the first-ever International Blind Tennis Tournament in Spain. Chris Baily who has been selected to represent Great Britain in an international tennis championship for the visually impaired in Spain. He is one of six players who will represent the nation on the international stage. The team will travel to Alfaz de Pi on the Costa Blanca, Alicante, where 70 players from 14 countries will take part in the event organised by the International Blind Tennis Association. At the end the first blind tennis world rankings will be established. The opening ceremony is on Saturday (May 6), and sight classification sessions for the players will be held on Sunday and Monday. Matches will be played on Tuesday, Wednesday and Thursday, May 9, 10, and 11, with the trophy and closing ceremony also on the Thursday. Great Britain team manager and the Tennis Foundation’s tournament director Kirsty Thomson said: “We’re so proud to be involved in the first international Blind Tennis event. “Blind and Visually Impaired Tennis is continually growing as a sport. “With the chance for players to now secure a world ranking, as well as compete domestically in the Tennis Foundation structure of regional tournaments and National Championships, it can only continue to go from strength to strength. Chris, 39, who is a member of Maresfield Tennis Club, won the National Visually Impaired Championships last year after been runner-up for two years. He also won the doubles title for the third time last year. Chris has a condition which means his eyesight is gradually deteriorating but he is making the most of the sight he still has. Read about how Chris became national visually impaired tennis champion in another Uckfield News story here. The visually impaired version of tennis is adapted from the full court version to a smaller court, with a lower net. It also uses an audible ball so players can hear it bounce and being hit, and, depending on an individual’s sight level, they can also be allowed up to three bounces before they must return it back to their opponent. The Tennis Foundation’s aim is to make tennis a sport which is inclusive and accessible to all. It is hoped that in sending a Great Britain team to the first ever International Blind Tennis Tournament it will help raise the profile and awareness of visually impaired tennis in this country and inspire more people to play tennis in the UK, whatever their disability. The foundation works to open up tennis to its priority audiences of disabled people, young people in education and people in lower socio-economic communities, making it possible for them to enjoy the many health and social benefits of the sport whilst maximising their personal potential. It supports and promotes visually impaired tennis in Great Britain, including delivering tennis taster sessions at the majority of the British Blind Sport ‘Have a Go Days’ to help blind and partially sighted people to try out the game, subsidising camps to help players develop their skill, and running a series of regional and national tournaments for blind and partially sighted players of all abilities, junior and senior. To find out more about the work of the Tennis Foundation visit www.tennisfoundation.org.uk.